I wasn't going to post again this weekend but today something happened that got me thinking about my blog so I thought I'd share. Simon and I popped out to the local shopping mall to one of our favourite lunchtime restaurants which is tucked away in a hidden corner of the shopping centre. We love it and it's definitely a favourite with other local bloggers as I've seen it pop up time and time again. We had a really lovely time and I took some great photographs of all the yummy food which I shall be sharing with you at some point over the next few weeks. After our meal I decided to head upstairs to an area of the mall that overlooked the restaurant, as I liked the idea of getting some nice photographs to offer my readers the perfect view. I'd taken a few when suddenly I was approached by the mall's security who asked me to stop taking photographs as it wasn't allowed. To start with I thought they were joking and so just stared at them thinking that sooner or later one of them would crack a smile and tell me they were just kidding. But no, they were being serious! Apparently, me taking external photos of the restaurant was considered "stealing the design" and I'd have to stop immediately. Simon, being the wonderfully polite man that he is, apologised to them and we walked away, me feeling a little shocked and confused. I spent the next 30 minutes or so debating the issue in my mind. 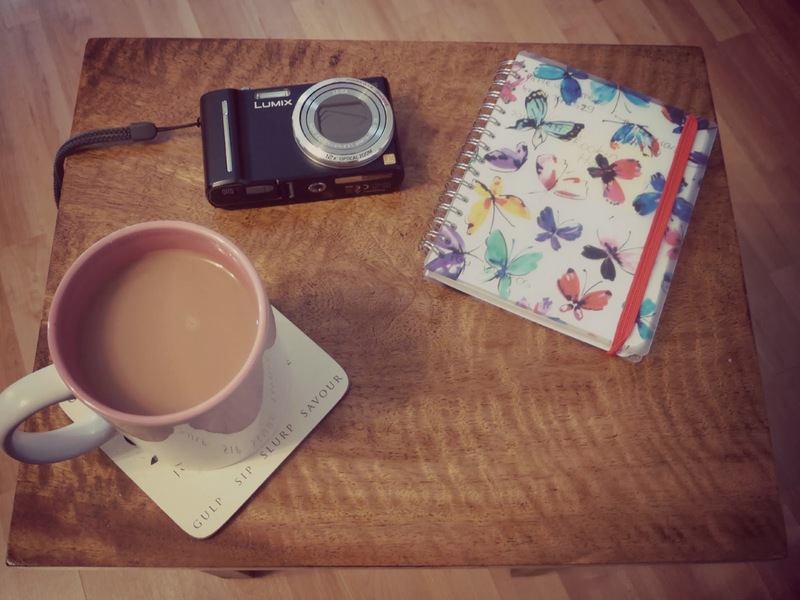 I've been blogging now for 9 months, I have a small amount of really lovely readers and feel like I'm getting slightly more involved in my local community. Most local businesses and restaurants here in the North East seem to really embrace bloggers and we all work well together. I love promoting local business and I'm very passionate about the North East which is why it's the main focus of my blog. I like to think that my tiny little corner of the web might inspire someone out there to maybe come up north and take a trip to Newcastle to see all that it has to offer. My blog is my hobby and it's a hobby I love. I'm not a professional blogger, I don't carry a massive camera, I'm not talking to thousands of readers. I'm just little old me, sharing what I love with the few people that enjoy reading my ramblings. Being the law abiding lady that I am, on the way home I decided to pop into the mall's Information Centre to check if I'd done something terribly wrong. I spoke to a lovely lady who told me that there's not really a straight answer about when you can and can't take photographs inside a shopping mall, it depends on the mall in question and their rules but if in doubt it's probably best to contact the Management and ask them in advance if photographs are allowed. I've spent a little bit of my afternoon reading up on the issue of taking photographs, and in general it seems to be that you are able to photograph what you like if you're standing in a public place (ie the road outside) but the problems arise when you are taking photographs on private property (ie in a shop or restaurant). This obviously becomes a little bit of a grey area where you consider how techy our world has become. Everywhere you go people are in restaurants, bars and shops taking photographs with their phone, sharing them on Instagram and tweeting them for the world to see. I doubt all of these people have the permission of the owner. Even before I started blogging I'm very much a person who always has a camera in her handbag. Over the years I've taken photos of anything I love the look of including interior shots of bars, hotels and restaurants - anything that catches my eye and looks beautiful I've always felt the need to want to capture it. Being a lifestyle blogger I don't always know when I'm going to want to take a photograph, it's not always something I've planned in advance - sometimes something just catches my eye and inspires me to take a snap. Now I think I'm going to have think twice before pulling my camera out. Not being a professional photographer, blogger or journalist, this isn't really an issue I've ever really considered, which is perhaps a little silly of me. I obviously don't want to get myself in trouble or upset anyone so I think in future I shall be asking anywhere I blog about if they mind me taking photographs of their interior and product. With my blog being so new I still feel like I'm finding my feet with it. I love it but I'm probably a little way off wanting to walk around waving my "New Girl in Toon" flag in every establishment I walk into. However, this encounter has made me realise that I am going to have to come out of my blogger shell to tackle this issue. I'd be so interested to hear your thoughts. Has anyone else ever been told off for taking photos? How did you deal with it? Do you now ask permission before you take photographs for a blog post? Because I studied Photography at college and went out on assignments alot, we were always told to ask permission - so I guess I'm used to asking before shooting (just like at the St James stadium tour we were on recently). I understand it when it comes to shops or places where there are alot of people as it could be classed as breech of confidentiality...but in the way you were taking photos, I really can't see the harm! Thanks for your thoughts hun, I think this is the thing - as I've never studied any form of media at college it's not something I've ever thought about. I'm quite surprised this is the first time it's ever happened to me considering all the photos I've taken over the years! Now I've been approached I do kind of realise I've been a bit silly not to think about it before, even if it does seem a bit daft ... it's certainly made me think! ... and we were always watched when walking around with cameras when I was in college. That's the thing! I'm going to feel so daft saying "Hi, I'm here to take photos for my blog" like I'm some kind of big and important press type person ... I'm really not! I guess it's just something to get used to though! I bet if you'd been using a phone it wouldn't have been a problem. Stealing the design seems a very silly excuse too. Surely if you really wanted to steal the design looking at it would be enough? I don't tend to take pictures at craft fairs or of photos/art in galleries as I'm worried someone might say I'm stealing the idea - that seems more understandable though. Pretty sure if I had designed the shopping centre I'd be happy people were admiring the way it looked rather than the clothes in the shops.. I know, that's what I thought! Yesterday I took a photo of some PJs in Primark on my phone and uploaded them to Instagram .. it's just modern life really isn't it? Everyone snaps and shares! It's not like I have a massive professional looking camera either, it's just a dinky little thing! I guess people can just be a bit funny! I always think your house/car as well as obviously yourself must be in so many photos out there that you don't even realise and that you'll never ever get to see ... it's just something you have to accept really! I usually ask, in this situation though to be a bit sneaky you could always have asked your husband to stand in a position when it looked like you were taking a photo of him! Wow, seems very odd! I can totally see it when it comes to theatre/musicals etc and important places like airports/ government buildings, but a shopping mall? Really? Aw that's such a rubbish thing to happen, sounds like the security guards were having a quiet day! I'm always quite sly taking photos 'cause I just find it embarrassing, but I assumed most businesses would like the free PR. I can't imagine many other places would be like this, I guess if you know where you're going beforehand you could ask, but I'm the same, I just whip out my camera when the mood takes me. Sounds like the angle you were trying to get was really interesting too - looking forward to your review anyway! Yeah I guess there were no kids to chase round the mall on a Sunday afternoon! Grrrrrrrr that is annoying, especially after you checked about for a sign! I keep thinking back to other times I've taken photos in malls and the whole thing just seems more and more ridiculous! Thank you :) When I told him it was for my blog he looked really confused, I'm not sure he understood what a blog was! It really seems to be an issue in shopping centres in the UK and Ireland. I work as a reporter with a local paper and if I'm doing a story in a mall with our photographer we have to sign in with security and he can't include any shop signs in his shots. As an amateur photographer and blogger, it annoys me that I can take photos in galleries or museums although it seems to be permitted in Europe and the US. I'm always wary about taking photos of other people's children, even in public places. I think some street photographers will ask permission before taking people's pics but others think it spoils the moment. And yes, the whole thing phone thing has made it ridiculous. This is something I encountered when taking photos for my first Brighton blog post. It was one of the art shops on the sea front and the man was pretty rude about it. I see people's points about stealing design's etc but at the same time, perhaps they should ask the person what they're taking the picture for first - especially as bloggers provide a bit of free exposure for their store/restaurant. Now I am careful and do ask shop owners before I take pictures. I do get embarrassed but I just think the worst they can say is no and it's not the end of the world. If anything, it's their loss! No not at all :) I'm not going to let a miserable security guard put me off what I love doing. At the end of the day he was only doing his job and he was probably glad to have something to do on a slow Sunday afternoon! I understand their reasons for not letting people take photos but it's annoying at the same time. In 2008 a security guard called on me when I was trying to take a photo of Metrocentre's Christmas tree and at the same time he was telling me off, a few metres from me, there was a young man taking a photo of the same tree with his mobile phone. How come I get told off and he doesn't? The only difference between him and I was that I was using a Kodak camera and he was using his phone and he could pass for someone just texting instead of taking a photo. OMG that is even more ridiculous! They should have been happy that you were so impressed with the tree that you wanted to snap it! I just think that photos are great publicity .. it's annoying cos next time I want to review somewhere inside the Mall I'm going to really struggle!